"I went to bed at about 10PM and I let it run all night without focusing. I blinked through the images and focus did not change. Also, I did all of my other images by letting it run through the night without focusing." The only instruments in the world that use carbon fiber for 95% of the weight of the structures, including the all-important mirror mounts. These athermal instruments also use Dream's highly engineered, thin-featured zeroDELTA lightweight glass mirrors, for truly cutting-edge performance, eliminating century's old performance losses in both mechanical and thermal areas. Field Of View: 71.2' x 71.2' at 1.04 arc-sec/pixel. The zeroDELTA engineered primary mirror is 20.5" physical OD, over 3" tall at the edge, yet weighs only 20.0 pounds. Delivering unrivaled performance & SWaP-C.
Download the raw, full-frame FITS files from this folder to see the world-leading performance from one of Dream's 20" f3.5 Dream Astrograph. Absolutely no processing has been done to any of the files. Most test images are 5 seconds, to show the performance of the system, as opposed to allowing numerous errors to form a round, but bloated star. Real-world performance should be judged from full-frame raw, unaltered images. Ask manufacturers for raw, full-frame files that use short exposures. Otherwise the shape of the stars can be misleading because long exposures can hide numerous issues. Don't settle for cropped images that are used to show a sweet spot or settle for processed images. If the optical system has dealt with all of the issues and truly has world class performance, then it shouldn't need to hide behind anything. Actual high-performance means both higher resolution and achieving a deeper magnitude faster. Athermal by design - Focus was not touched for any of these test images, which spanned two different nights; October 30th, 2018 and November 3rd, 2018. 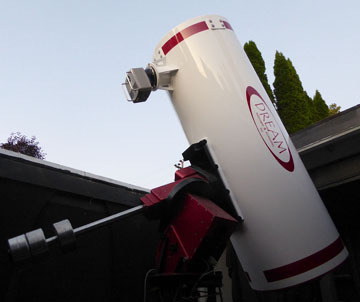 Dream has tested this telescope over more than a 20°F temperature change and still not detected degradation to the on or off-axis quality. This athermal performance, combined with the high stiffness of not just the structures but the designs that Dream uses, provides unprecedented stability and consistency of that high performance. Dream also has an extremely fast thermal time constant because it has fully dealt with both mirror seeing and instrument seeing. This provides the lowest possible maintenance, yielding the highest throughput. Optical alignment of this and all Dream Astrograph telescopes is achieved during the day by using the dedicated alignment tools provided to our customers. Both the primary & secondary mirrors are coated with First Contact prior to shipping. 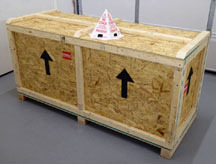 This protects the precision optics during shipment and provides pristine optical surfaces for Dream's customers. Dream is the world leader in installed high-performance opto-mechanical systems because we have dealt directly with the traditional performance losses associated with; stiffness in structures and the thermal issues within and around mirrors. From day one Dream has focused on its engineered, high-consistency CFSC & CF structures that offer far higher stiffness and are used extensively in the instrument, not just one or two components. Dream has also pushed the zeroDELTA lightweight mirrors to unrivaled performance levels. Both of these technologies are designed & produced in-house, giving Dream unusual control, optimization and performance gains from this closed-loop approach. Dream has unmatched full instrument stiffness; no focus shift due to sky location (slew to and immediately image) and no settling affect either. Because of the high stiffness and athermal nature of Dream's dedicated carbon fiber structures and the zeroDELTA lightweight mirrors, these opto-mechanical systems are at the cutting edge of both mechanical and thermal performance. If an optical system shows focus shifts at different instrument angles, it is a red flag that mechanical bending of the structure(s) is occurring. Adjusted focus images are not a true indication of performance, because it adds yet another area for performance loss. Mechanical tilt means off-axis performance has been lowered. Actual high-performance means keeping the optics aligned & focused to today's modern and very tight tolerances, not tolerances from 20, 50 or 100 years ago. What the instrument does on a horizontal test bench tells you nothing about that instrument's installed (dynamic) performance. Ask a manufacturer for raw images where focus and collimation were not touched at all during any of the test images, assuming the instrument was tested in a realistic environment at all. Dream's instruments are setting a new standard, through our disruptive and enabling technologies. All exposures are 5 seconds, unless otherwise noted. All exposures were taken through the luminance filter. The CCD used during testing: KAI-11002, 9µm square pixels, 4008 x 2672 (full-format, 42mm diagonal). Shipped November 27th, 2018, to start a 5-year NASA program of NEO search & recovery. You can look at data from two additional telescopes on this page.